The festa season in Malta all but closes down in October. 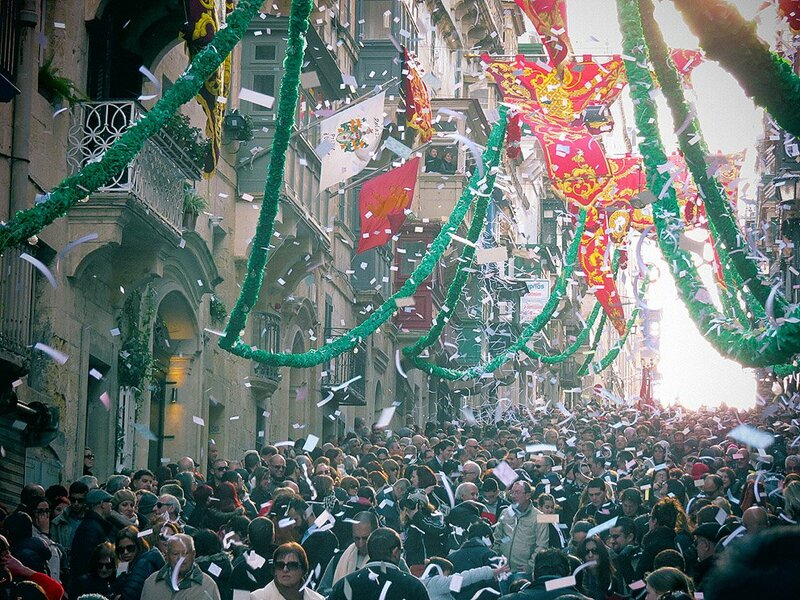 Only a couple of feasts are held after the end of summer – the last major one being Bormla’s Immaculate Conception, celebrated right at the tail end of autumn on the 8th of December. Winter is all but barren of feasts – but there’s one bang of an exception – Valletta’s Saint Paul Shipwrecked. The St. Paul’s parishioners look up at the skies in the days prior to the feast and check weather forecasts with some concern – and with good reason too. The feast is celebrated on the 10th of February – supposedly marking the exact day some 2,000 years ago that reputedly a strong gregale storm drove Paul’s ship onto the rocks at Saint Paul’s Bay (well, where else!). This particular Valletta feast is characterised by markedly less foodie and beer stalls in the streets than the feasts celebrated throughout summer; but then in February – often Malta’s nippiest month – people tend to congregate more in bars than in the streets. But the merriment at Saint Paul’s feast is quite unique – and quite a sight too. On the feast day proper a band march starts off from Republic Street at around 1pm – and in typical Maltese fashion it is popularly referred to as Il-Marc tas-Siegha (the 1pm march – again…what else?). The march starts off from Republic Street as a rather quiet affair and remains so as it makes its way past St. John’s Cathedral, up Merchants Street and then through Melita Street, by which time any uninitiated festa enthusiast is tempted to yawn off for home. But when the band starts its way down St.Paul Street – that spectacularly steep street that is the parish’s main drag – it is then the fun starts. 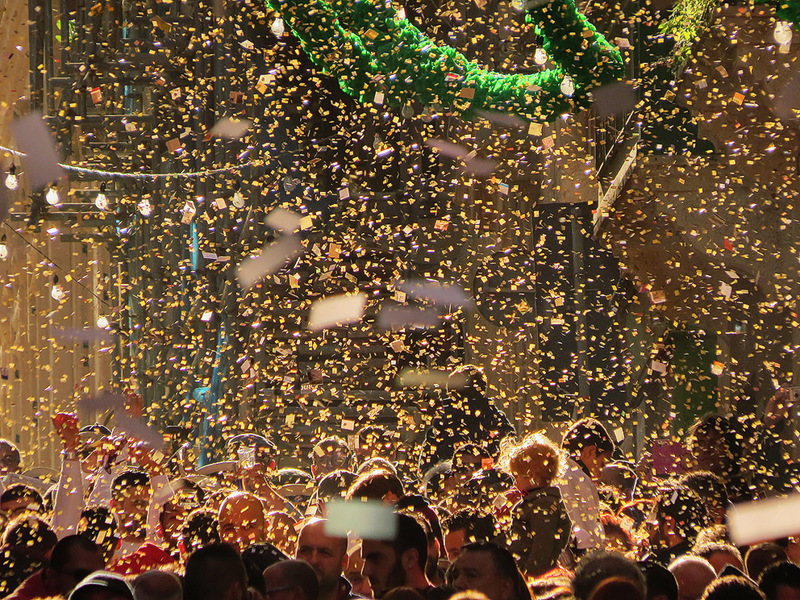 The hitherto empty street fills up to the gills quickly and a veritable barrage of paper confetti rains down on the band for as long as it takes to play its way down the street – normally a three-hour stint during which the confetti doesn’t stop coming until the street is awash in paper. Snowball fights being an impossibility in Malta, the children of the parish make do with this substitute – and it is not unusual for grown-ups to get involved too. 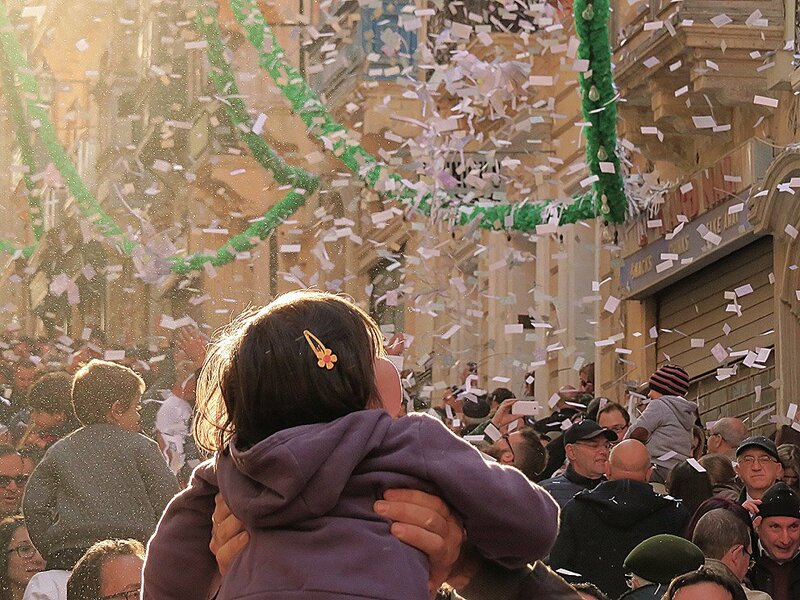 The band march only rounds off in the late afternoon, by which time the procession with the statue of the saint is ready to start its annual round of the streets of this proud Valletta parish – naturally to ever more confetti. This out of season feast is a true heart warmer, a joyous outburst of genuine Valletta warmth in a cold time of the year. One celebration that is definitely not to be missed if you are around at this time of year, and another reminder of how the good life can be celebrated in such a simple and emphatic manner. Note: The feast of St Paul’s Shipwreck in Valletta, normally celebrated on 10th Februray will this year be celebrated on Saturday the 30th January when both the band march and the procession with the Saint’s statue take place, as for the first time in nearly 80 years, February 10 will mark the start of Lent, also known as Ash Wednesday.